The University Undergraduate Certificate in Agricultural Business Management (ABM) is offered to any student enrolled as a non-degree studies (NDS) student at NC State University, and enrolled in an associate's degree or 4-year degree program or has already received an associate degree. This 15-credit-hour certificate provides students an opportunity to learn basic business and economic principles that are useful in careers in agricultural and related industries. Like all designated university certificates, this program has gone through an approval process at the university level. Must submit separate, University Undergraduate Certificate in Agricultural Business Management application, and official transcript, after being accepted as an NDS student. Please see "Program Contacts" for contact information to obtain application after NDS acceptance. The certificate requires 15 credit hours, as well as a three-credit prerequisite course. Students pursuing university certificate programs are considered non-degree studies (NDS) students for the purpose of university registration. NDS students may register for a maximum of six credit hours per semester. Thus, the certificate may be completed in as little as three semesters. This is a university certificate program for undergraduate non-degree studies (NDS) students interested in agricultural business management. Requires 15 credit hours. COMPLETION REQUIREMENTS: Completion of 15 credit hours from the list of required and elective courses with a grade of C- or higher received for each course and an overall GPA of 2.0 or higher must be achieved upon completion of all required courses. None of the required 15 credit hours may be taken for S/U or “credit only.” All courses must be 601 sections taken through distance education unless special approval is granted for completion of an on-campus section to allow the student to successfully complete the course sequence for receipt of the Undergraduate ABM Certificate. No transfer credits from other institutions to fulfill certificate course requirements are allowed. Four (4) years will be allowed for completion of all courses. The time limit starts with enrollment in the first course. Students will be allowed to defer no more than two semesters after acceptance into the program. 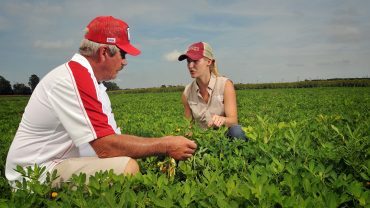 Applicants currently enrolled in an associate's degree or bachelor's degree program at another university may apply to and be approved to enroll into the Undergraduate Certificate in Agricultural Business Management Program; however, before the certificate can be awarded, the student must complete the associate's degree or the bachelor's degree. Proof of receipt of the associate's degree or B.S. or B.A. degree should be provided by an updated official copy of applicant’s transcript from the degree conferring institution. This requirement must be fulfilled in addition to other certificate program requirements. A total of 15 credit hours is required. Introduction to economic principles of marginal benefits and costs with application to consumer and producer decisions. Functions of market exchange systems in determining prices and quantities and creation of wealth. Property rights and opportunities for exchange. Role of government in dealing with agricultural and resource problems. Macroeconomic analysis including inflation, unemployment, money and banking system. Credit will not be given for both ARE 201 and either EC 201 or EC 205. Analytical and planning techniques for making business decisions centered around farm business applications. Economic principles and management concepts such as budgeting, accounting, finance credit, investment analysis, business organization, risk,and taxes as related to practical problems of operating a farm business. Management decision-making by food, fiber, horticulture, and forestry firms. Emphasis on current agribusiness topics such as information utilization, strategic planning, organization structures, competitor intelligence, pricing, leadership, crisis management, ethics, and human resource management. Business communications, agribusiness case studies, and a computerized management simulation game. Current federal and state environmental laws and regulations and their common law foundations. Relationship of the law and its regulatory mechanisms to economic policy issues: externalities, pollution taxes, incentives, permit trading, and cost-benefit analysis. Major environmental topics including water and wetlands, solid and hazardous wastes, pesticides, clean air, endangered species and nuisance actions. Overview of the legal system. Agricultural marketing system and economic forces affecting its structure and efficiency. Public policy issues affecting agricultural markets. Emphasis on the analysis of current sources of agricultural market information. Marketing and storage problems over time; futures markets and the management of risk; transportation and international trade; government agricultural programs. Application of marketing and economic principles to decision making in contemporary agribusiness firms. Marketing strategies, marketing research and information, segmentation and targeting, marketing mix, and market plans within food, fiber, natural resource, and production input industries. Professional selling skills and knowledge. Off-campus field experience and visiting lecturers from the agribusiness industry. Record keeping for small businesses organized as sole proprietorships, partnerships, and family held corporations. Double entry accounting principals applied to service and merchandising businesses. General Journals, Combination Journals, Subsidiary Journals, Ledgers, Accounts Receivable, Accounts Payable, Posting, Worksheets. Financial Statements, Closing, Payrolls, Cost Basis, Depreciation, Section 179, Amortization, Financial Adjustments, and Income Tax Forms. Both manual and computerized systems. Semester project of keeping records for a business for a portion of the year. ARE 323 teaches the history of monetary systems, the development of business finance tools and banking, and detailed creation and use of business financial statements, including Income Statements, Balance Sheets, and Statements of Cash Flow, within the context of the agribusiness industry. Two Finance courses are offered in the Agribusiness Management Major: ARE 321 - Agricultural Financial Management, which focuses on the history of finance in agriculture and financial planning for farmers and similar independent agricultural enterprises; and ARE 323 - Agribusiness Finance, which focuses on finance for larger agribusinesses and for managers of agribusiness divisions in larger organizations. General introduction to human resource management in agribusinesses. Skills for agribusiness owners for efficient productivity from employees in a legal and ethical manner. Topics on labor economics, human resource legislation, employee planning and recruitment, and migrant labor issues. Emphasis on techniques for training, motivating, leading, and disciplining employees. Global trade is the largest growth area in American agribusiness, and knowledge of international agribusiness markets is one of the primary qualifications desired from college graduates entering the workforce. This course provides detailed knowledge of the six major regions for agribusiness trade worldwide, to prepare students to understand, speak intelligently about, and capitalize on opportunities for NC and US agribusiness products in the global marketplace. Students will be required to provide their own transportation to local markets and incidental expenses for meals representative of the six major regions connected with class assignments. Please see the Instructor for details. Ethical behavior is a crucial issue in American business, especially after numerous ethical lapses over the past decade, and for agribusiness given claims of marketing unhealthy foods, development of genetically-modified organisms, hiring of undocumented workers, and consolidation into industrial production facilities. Students are taught ethical theories and frameworks, used to discuss general ethical questions such as death, theft, and lying, followed by the more specific agribusiness issues mentioned above. Students will formulate their own opinions about these issues, recognize and understand the opinions of others, and be able to accurately and adequately communicate those opinions. Presentation of material not normally available in regular course offerings or offering of new courses on a trial basis.